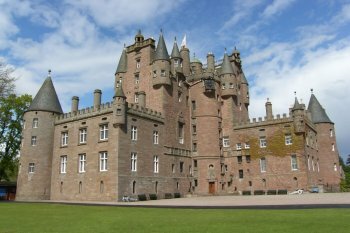 Located just over five miles south of the town of Forfar in Angus, Glamis Castle was originally a 14th century keep which has been extended extensively over the years. Macbeth was Thane of Glamis but did not own the castle. King Malcolm II is reputed to have been murdered in the castle (with blood stains on the floor of "King Malcolm's Room" to prove the claim). In the 15th century the lands were held by Sir John Lyon, Chancellor of Scotland who married the daughter of King Robert II. The castle is still held by the Lyon family, now elevated to the Earls of Strathmore and Kinghorne. The 9th Earl became a Bowe-Lyon when he married a Yorkshire heiress. It is the childhood home of Her Majesty Queen Elizabeth The Queen Mother, the birthplace of Her Royal Highness The Princess Margaret and the legendary setting of Shakespeare's play "Macbeth". Though the Castle is open to visitors it remains a family home. The castle has the reputation of being the most haunted in Britain, including "Earl Beardie", the 4th Earl of Crawford who is said to have played cards with the Devil in a walled-up room. There is a large park, nature trail and garden and statues of Kings James VI and Charles I still survive. In addition to the castle, there are exhibition rooms, four shops and a restaurant. Nearby, the Angus Folk Museum a less opulent but nevertheless an interesting attraction. There is a Pictish cross-slab in Glamis village manse called "King Malcolm's Stone" and an interesting thatched Cottage.